Google will remove (Discontinue) “Google Now Launcher” from the Playstore. Why? After reading the title, you might be wondering “Why would Google remove such a successful Android App?.” Because, currently Google has 2 Android launchers on Playstore, Google Now Launcher & Pixel Launcher. After the removal of Google Now Launcher, we can expect Pixel launcher to be made available for all the Android device. But sadly, Google will remove it’s Stock & simple looking Google Now Launcher from the PlayStore & discontinue all its development. The Google Now Launcher is a home screen manager that Google made using the Android launcher code as a base. Originally made for the Nexus 5, later was available for all the Android devices running Android 4.1+. 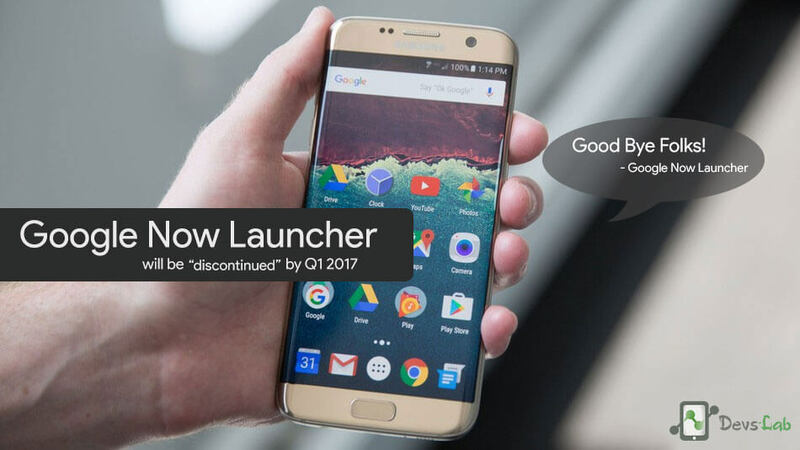 According to Android Police, Google is sending out letters to OEM partners declaring that the Google Now Launcher will be retired in Q1 2017. Devices that have the launcher installed will be able to continue using it, but the app will no longer show up on the Play Store. Why will Google remove the Google Now launcher? As the Google Now launcher didn’t have much except the Google Now card & few beauty added to it, we haven’t seen any updates to the app since November 2015. Because, there’s nothing much to update as the only thing that the launcher has, is the Google App. Google Now Launcher is also part of the Google app. Every Android phone that has Play Store access has the Google app installed, and what you see when you slide right to look at your cards is part of what the Google app does. The launcher only does the job of adding the Google App to a basic launcher with stock appearance. After removing the launcher app, Google is now allowing access to those bits of the Google app through a new Search Launcher Services API. That’s what Sony used to integrate the Google Now panel (now just the Google Feed) into its stock launcher a while back.What it means is, companies who are official Android partners can now include the “Google now” cards in their launcher. 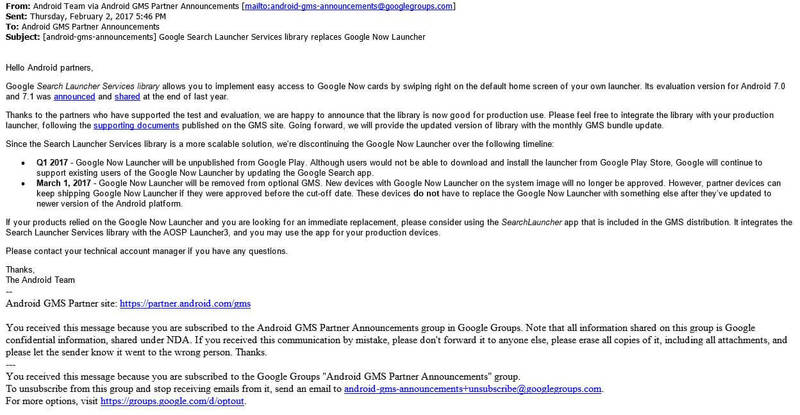 Due to this, companies can make their own launcher using the Android base code & add the Google now card feature. They also can change the base code to do a lot more things and still include the Google now bits and pieces. This makes for an easy fix for companies like Motorola who ship their phones using the Google Now Launcher. What about the Nexus devices? Nexus users can still use the Google Now launcher & it will work just fine. Although there’s no official confirmation of Nexus devices will be getting Pixel launcher as their default launcher. The official Android Nougat update will reveal everything. Google Now in Third party launchers (Nova launcher)? If you’re thinking that the release of Search launcher services API will allow the developers of third party app to integrate the Google Now feature in their launchers, then you’re wrong. Only he people who are building Android phones and are official partners can build the Search Launcher Services into their home screen launchers. That means people like Samsung or LG can do it, but not the folks from TeslaCoil Software who build and distribute Nova Launcher. Or any other developer who doesn’t work for an official Google partner. Why the removal of Google Now Launcher is good? Since the Google Now launcher is not updated since Nov 2015, why are you using it? Just because of the Google Now cards? Ever thought, Google Now launcher should be having some customization option? Since companies will use the Google Search launcher services API, you’ll get swipe right Google Now cards in most of the Android phones. Which means, A launcher with customization + Google Now cards. You can download Pixel launcher instead of Google launcher now! Regardless of what Google decides to do, Android users always find their way around things. We will always be able to grab either APK from a third-party and install it. Just like we are installing the Pixel launcher. Top 10 Best New Android Apps of February 2017.